I really enjoyed watching this short action film, which includes one of the most intense human-pigeon duels even conceived. The story begins with a secret agent and a curious pigeon that is more interested in the doughnut that the agent is eating than the mysterious briefcase that he is carrying. In the following pictures we can see this initial scene: under the surface of this professional-looking secret agent with his serious expression there is actually an awkward, amateurish agent that is unable to keep under control a pigeon that is irresistibly attracted by his doughnut. Accidentally, the pigeon takes the control of the briefcase, which is actually a high-tech nuclear weapon, armed with the latest technology. As we can observe in the picture below, the pigeon is not as innoccent as it looks and it will fight till the end for its doughnut. The rest of the story features the duel between both protagonists for the control of the briefcase and the doughnut itself. It is better to watch it on the official web site. Link here. 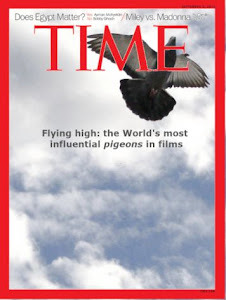 Source: Pigeon: Impossible. Starring moment: all the recording. Pigeon activity: It is a common pigeon wandering around the streets. 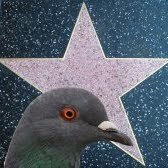 However, in the recording we can see that the pigeon progresses from a quite simple animal to a very skilled die-hard enemy almost impossible to defeat. Symbolism: This is an example of how the combination of innocent-harmless creatures and deadly weapons can create lethal situations.